We learn through conversation and inquiry. When I facilitate a workshop or help others planning and designing their workshop I always go for ‘as much conversation as possible and as little input as necessary’. Making this suggestion I often hear: ‘But we need some input too!’ My viewpoint seems too radical; an expert standing in front of the audience informing and inspiring the people in the room is what is expected. Still. And indeed it is true that we are used to a learning event with input in form of keynote presentations. First, we can access information almost anytime and through many channels. The information is available in online libraries, databases of thematic networks, journals, blog posts. Also recorded talks and webinars are at our disposal. We only have to change our information seeking behavior. Second, I find it a pity to ‘waste’ precious workshop time for informing us. I suggest we rather use the time to connect our ideas and experiences. By putting our heads together and investing time for jointly exploring an issue we deepen our understanding and uncover options how to deal with it. It is through real conversation that we learn to see and overcome our myopia. Third, too many challenges we are facing require more than expert talks. For many situations the old model of transferring knowledge from the knowledgeable to the unknowledgeable does not apply any longer. The problems we deal with are not simple. What we need is not best practice but next practice adapted to the context. Implicit knowledge is like flow that requires constant interaction to make sense. Fourth, we learn best through conversation. Through conversation we explore an issue actively, we engage with others, their experience and viewpoints. We dig deeper, we discover and uncover, elaborate on different aspects and options. Through thinking jointly we improve our understanding. Dialogue is the kind of conversation we need to promote in order to facilitate knowledge sharing in organizations. The goal of dialogue is not winning or convincing, but reaching deeper level of collective understanding. Dialogue involves asking questions, seeking clarification, testing understanding, and looking for that ‘aha’ moment when knowledge is really transferred. It helps us access and build deep tacit knowledge and it allows us to check whether we have really understood the knowledge. Fifth, when we don’t know what we don’t know. We need inquiry not inputs. Searching for answers is best done jointly and with a mind open to explore, probe and observe. Knowledge doesn’t sit still. You’ve got to be on your toes – you’ve got to improvise, solve problems, strategize, jump on opportunities. And bring others along. Learning that matters today is social, in real time, and inventive. More often than not, what we need to learn is not yet known. And that’s why we need a new learning model. Sixth, the expertise is sitting in the room. We just have to frame the discussion to unlock the experiences, insights, viewpoints and questions of the people attending. Knowledge generation is collaborative; it is the facilitator’s role of bringing the many forms of knowing together (see Curtis Ogden’s interesting blog post on the place of expertise). We too often under estimate the knowledge that attendees have, assuming the “expert” is the only one who “knows”. Seventh, a conversation is guided by many. Conversation is inquiry, starting point is often a leading question. The course of a conversation is open while an input is already “thought through”. As a presenter it is difficult to understand what your audience already knows about the topic and what they are interested in knowing more about. We all make guesses based on our experience, but it is so much more effective for the learners to guide the conversation in the direction that is of interest to them. Eight, and last but not least, conversation is input. 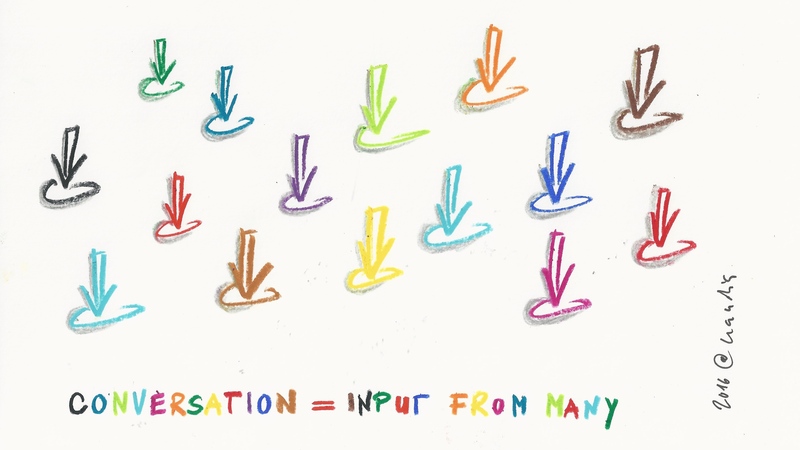 Conversation allows for ‘inputs’ from many. By building on the bits and pieces that we bring together through conversation we manage to complete the puzzle. How are you seeing, understanding and working with “expertise” in your networks and collective change efforts? What have a mountain stream and conversations in common? Nadia, I love how you wove in “real voices” with quotes to build on the principle of voice and conversatioN!